Don’t we all want to be the Life of the Party? When her husband suddenly dumps her, longtime dedicated housewife Deanna (McCarthy) turns regret into re-set by going back to college…landing in the same class and school as her daughter, who’s not entirely sold on the idea. Plunging headlong into the campus experience, the increasingly outspoken Deanna—now Dee Rock–embraces freedom, fun and frat boys on her own terms, finding her true self in a senior year no one ever expected. 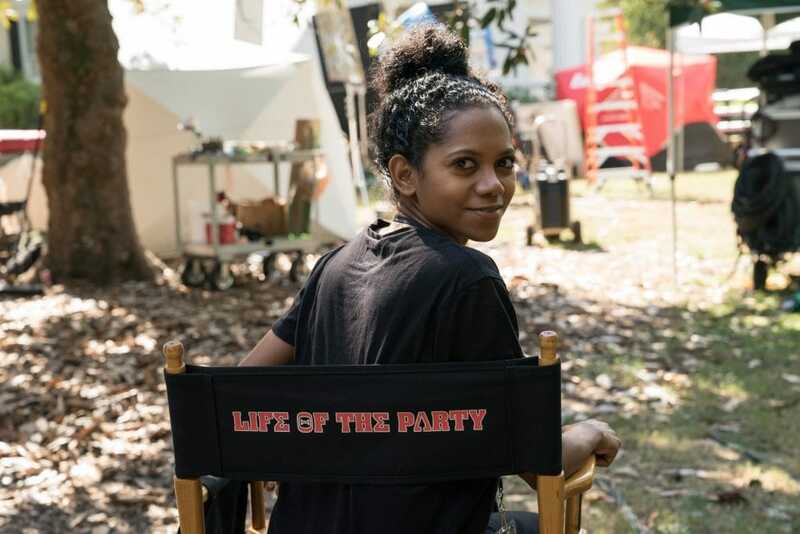 Life of the Party promises to be a delight for moms and daughters alike. During our Life of the Party set visit, we got a sneak peek at the massive sorority house where part of the movie was being filmed. We also chatted with the cast between breaks and learned some secrets behind the scenes. Here are 10 things about the movie Life of the Party that you wouldn’t in a million years guess. 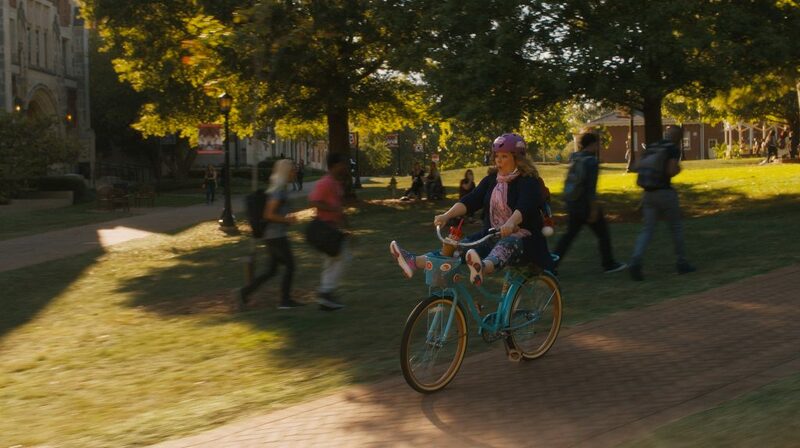 1) The look of Melissa McCarthy’s mom character was based on her own mother, right down to the hair. She said during the set visit, “my mom is coming to the set tomorrow and I know that every outfit I wear in the pre-stuff, she’s going to be like, “I love that top”…She’s going to be like “I hope you get to keep that sweatshirt” “. 2) The original idea for the movie was from her husband and co-producer, Ben Falcone. 3) Melissa’s favorite app to use with her kids is FaceTime. 4) Her kids are in the movie as flower girls! 5) The young women on the set really clicked with each other. They immediately bonded and there was no tension on set between them. It was like a summer camp. 6) Improv was a major part of the movie. Melissa and Matt Walsh (who plays her husband) would often add in their own bits and it just worked perfectly. 7) Matt Walsh didn’t audition for the role of Melissa’s husband. She called him up and asked him and he immediately agreed. 8) Molly Gordon, who plays Melissa’s daughter said her favorite scene was the walk of shame she did with Melissa after a particularly rowdy night. 9) Molly admits that while Melissa is an amazing dancer, she is not. 10) Molly didn’t finish college so she had to go do research for her role as a sorority sister. McCarthy and Falcone co-wrote the screenplay and produced through their production company, On the Day. Chris Henchy also produced the film, with Toby Emmerich, Richard Brener, Michael Disco and David Siegel serving as executive producers. Falcone’s behind-the-scenes creative team included director of photography Julio Macat (“The Boss,” “Horrible Bosses 2,” “Daddy’s Home”); production designer Rusty Smith (“The Boss”); editor Brian Olds (“Central Intelligence”); and costume designer Louise Mingenbach (the “The Hangover” films). The music is by Fil Eisler (“How to Be Single,” “Empire”). Life of the Party is in theaters May 11. Click here to stay tuned for more on their Facebook page. That sounds like a fun movie. I am looking forward to seeing it when it comes out. There’s going to be so much to relate to in this movie. I love Melissa’s movies too! It’s cool that a lot of improv was involved! Sounds like a fun movie. My mom likes movies like this one.